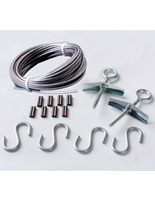 This banner hanging kit includes all the necessary sign hardware for mounting your posters overhead. 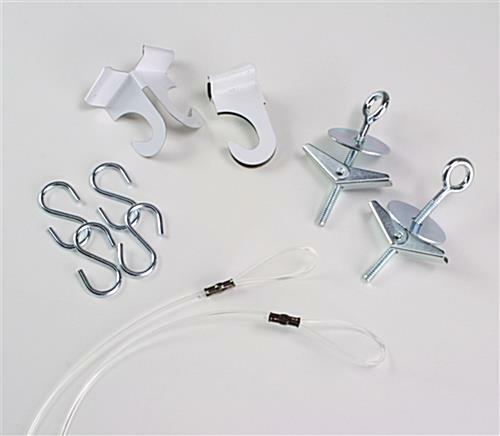 The display system includes 4 S-hooks, 2 pieces of 6” monofilament, 2 ceiling clips, and 2 toggle bolts all for suspending graphics overhead. 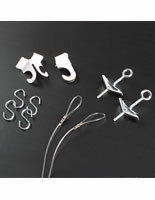 The hanging kit with clear line will blend in with any setting, casual or upscale. 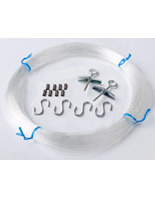 This is the shortest length of line that we offer, but longer choices are available. The kit is a great way to catch the attention of customers by presenting posters overhead instead of with traditional wall mount frames. The sign hardware is a display system that will not only save companies money, but will also help them to preserve floor and counter space.